You can count Spanish bond auctioneers among the few happy campers over in Europe this morning. The country’s 10 and 30-year sales of the debt instruments met with a warm reception albeit yields on the latter were up substantially from levels seen last month. Moreover, the country is expecting to avail itself of less than a third of the "FROB" bank rescue fund that totals 99 billion euros, in an indication that its banking sector is far more solid than the market vigilantes would have one believe. The publication of US-style stress test results on Spanish lenders is imminent. CDS spreads narrowed as a result, the euro gained additional traction (rising above 1.235 against the USD), and eurozone equities climbed as market players breathed a collective sigh of relief. At least for this round, Spain’s ‘we are not Greece’ routine worked. What happens when nearly 25 billion in debt matures in July, as they say, remains to be seen. The same majority says that inflation is too high. A 68% Q1 gain in Chinese housing prices, no doubt, helped reinforce such majority opinion. As for inflationary pressures, the bidding war that is erupting among Chinese manufacturers for employees as well as scattered strikes demanding higher wages, should both serve as alarm bells for the government. Precious metals prices continued to firm overnight as…well, for no other reason than momentum, really. That and the effects of the thinning ranks of participants remaining in the game as the lure of summer vacations continues to strengthen with each passing day. This, despite spectacularly familiar headlines such as ‘Last Chance to buy Gold ETF’ and ‘Gold Headed for $10000 by 2012’ [all that’s missing is the day and the hour]. A further attempt at a breakout to the upside was still being sensed among players as the New York session got underway. This is one train few dare to stand in front of in an attempt to test its braking capabilities. See a stronger euro, equities on the rise, and a modicum of calm in Europe. Not exactly the ingredients for a $10 pop prior to the opening in New York. The "European worries’ bit is wearing rather thin for this market, at this juncture. However, someone is running the Pamplona run weeks ahead of the real thing. Speaking of which, the start of the Thursday trade had gold showing a $9.50 per ounce gain at the $1240.00 spot bid level. Some $12 stands between that figure and the early June record high, albeit the trading range is still seen as remaining in place and stretching from $1215 to $1255 the ounce.. Silver added 12 cents to open at the $18.59 per ounce mark, while platinum rose $7 to start at $1574.00 the ounce. 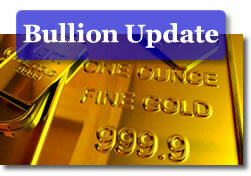 Palladium climbed $5 to the $477.00 per ounce level and rhodium was unchanged at $2380.00 per troy ounce. In the background, the US dollar was off by 0.48 at 85.72 and crude oil slipped 40 cents to the 77.27 mark — still near a six-week high, assisted by the weaker dollar and despite rising inventories. The euro was last seen trading at 1.235 while Dow futures edged lower on the unemployment data news. While on the subject of myth-busting, Bron also posted an utterly thorough and well-researched article on the matter of Australian Gold Confiscation. Read it here http://goldchat.blogspot.com/2008/11/australian-gold-confiscation.html and ponder the non-likelihood of same coming to the USA. Despite what certain commissioned sales ‘agents’ would have you believe. Agents most often heard on the Glenn Beck show. Speaking of which, the final piece of myth-busting comes from veteran bullion dealer Bill Haynes of CMI Gold & Silver over in Phoenix, Arizona. Mr. Haynes updated his previous article on the myths surrounding gold confiscation scares, the reportability or non-reportability of certain transactions, and such, with a fresh article entitled: "The Dangers of Buying Gold" –in the wrong from, from the wrong sources, that is. Read it here: http://www.cmi-gold-silver.com/dangers-of-buying-gold.html and educate yourself. Thank you, Mr. Haynes. Your clients should be grateful for your educational efforts. To see how the value of the greenback has changed over time, check out CoinNews sister site US Inflation Calculator.